For years, visitors have been docking their boats at the Scituate Harbor Marina and walking to Front Street, the town’s bustling waterside district, to shop and enjoy a meal. Maria’s Sub & Pizza has been a Front Street mainstay for over 50 years, serving up fresh, no-frills sandwiches, salads, and pizza that keep seasonal tourists and locals coming back year after year. Hands-down favorites among patrons are the meatball (Maria’s adds Italian sausage to their meatball mix), hot pastrami, and roast beef subs. (Insider tip: don’t ask for lettuce on your sub–it’s reserved for salads only–but there are plenty of other traditional sub add-ons available, such as tomatoes, onions, pickles, and hots.) A sure sign of the shop’s success: the line to order is often out the door during the summer. 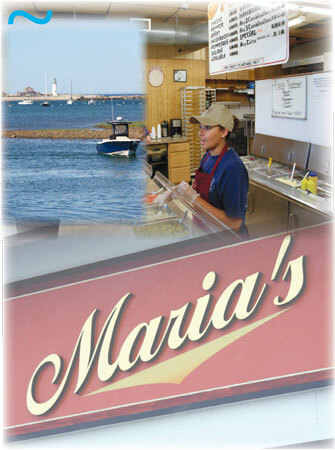 The service at Maria’s is fast and friendly however, so you’ll be back on the water in no time. Or, if you’re not quite ready to head back out, venture over to the Scituate Lighthouse with your subs for a picnic with a breathtaking view.